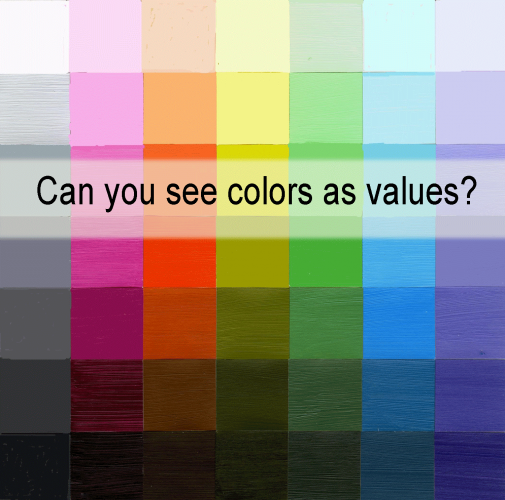 Why Are Color Relationships Mercurial? How often do you think about color relationships? Even though we painters deal with them every time we apply paint, we may not consciously think about how the colors will relate to each other while painting. 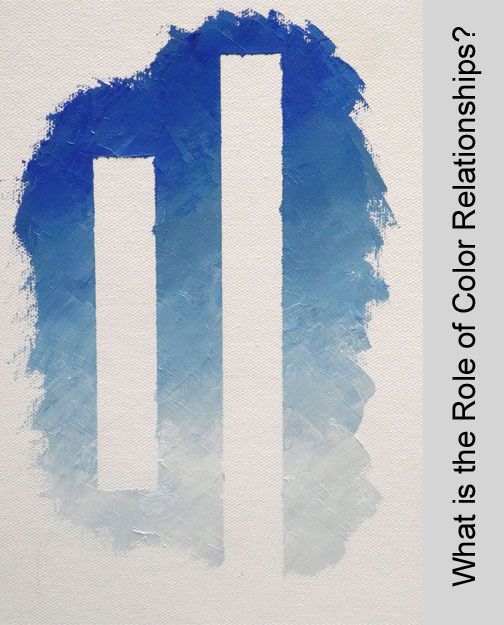 Why are color relationships important? Have you ever mixed a perfect color, then gone to apply it only to discover that it didn’t work? For me, even after 25+ years of painting, this frustration of believing I have mixed the correct color and it not working, still happens. This is because colors are volatile — they are shifty. In other words, a swatch of color is immediately impacted by the color surrounding it. We pick up a mixture from a palette that is essentially isolated. This mix is not surrounded by the same colors as on our painting. However, we believe it will look great on our painting. Soon we discover that is either looks good or it doesn’t. 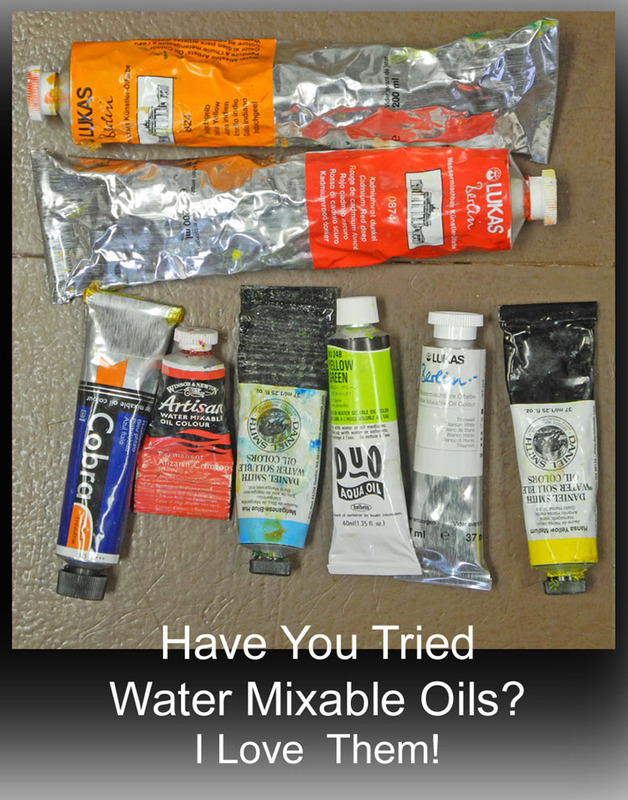 Have You Tried Water Mixable or Water Soluble Oils? Water soluble oils have arrived! Actually, they showed up in art materials stores over 20 years ago, but are just now becoming known and more frequently used. They are also called “water mixable” oils. Either will suffice, though I prefer water mixable because soluble can imply that the paint, once dried, will dissolve if it comes in contact with water. What is the Color of the Year and Why Care? The trumpets have blared! ~~~~ for 2017, the Pantone color of the year is Greenery! I always look forward to learning about the chosen color of the year. First of all, it’s just fun to see and then to read about how these colorists and designers came up with their decision. Secondly, it is interesting to learn what is trendy in the world of color; this decision impacts many areas of design and fashion. And thirdly, I like to see if it is a color I would want to incorporate into my paintings. In recent years, I have noticed that the chosen colors are more positive and lively. What color trends have you observed? 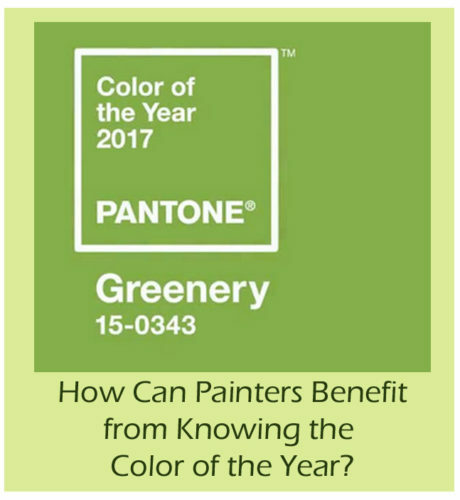 This year I found the video that shows the 2017 spring Pantone fashion color schemes as this relates to the color of greenery. I had not seen this before. It’s really interesting and fun to see. Hence, I wanted to share it with you. Why? Because the numerous color palettes for the color the year might be inspirational to you for possible paintings. Watch and see if there are any color schemes that you like. I thought I would share with you some examples of what I mean. 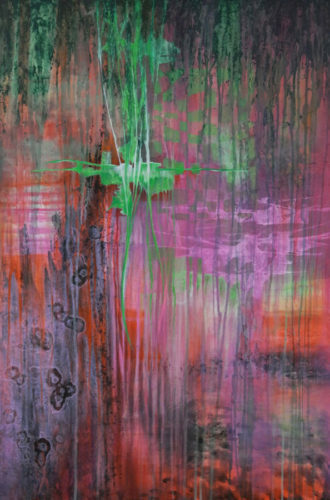 Below is my abstract painting “Spirit Dance,” that incorporates the green and pink/red color palette above. 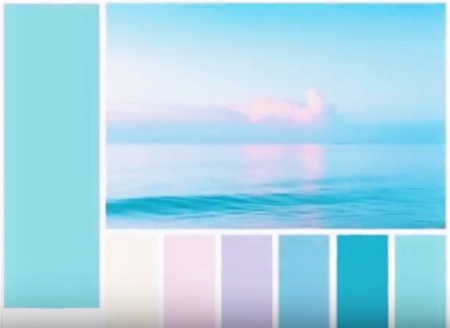 This next color scheme from the fashion video (FYI, I paused the video and took a screen shot of the image). You can see how it is almost monochromatic; this along with the blues conveys a calm effect. 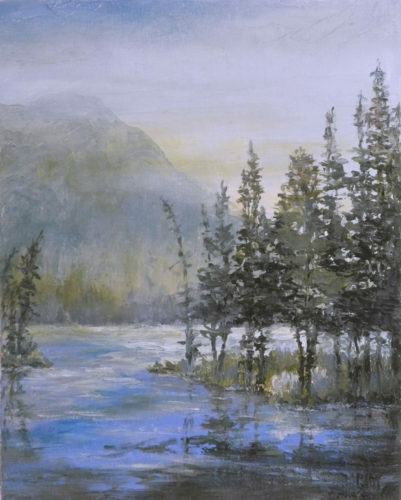 An example of this blue palette is seen in a small landscape of mine, entitled “Through the Passage.” What might you paint using this color palette? 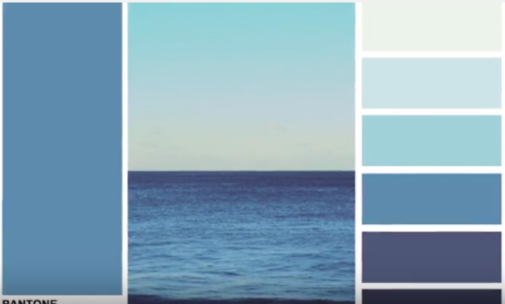 These next two images are other screens shots I took of color palettes shown in the color of the year video. 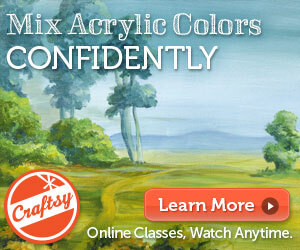 Have you completed paintings in the past that apply any of these color schemes? Perhaps they might inspire a future painting? Did you notice that not all of these color schemes include Greenery, the color of the year? Yet, here is a helpful resource available from which to benefit. 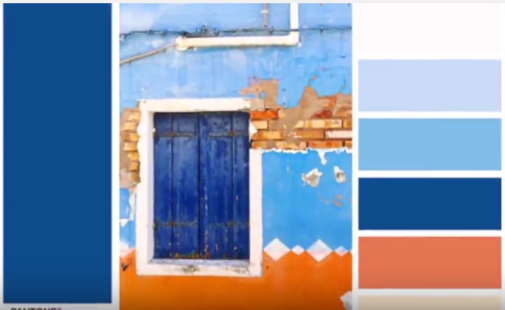 The next time you are stuck on a color scheme or just out looking for inspiration, consider watching this color of the year video or perusing the Pantone website. 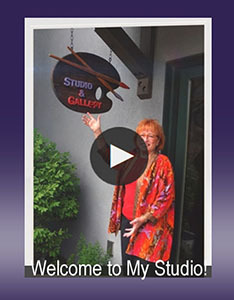 If you found this post helpful, please share it with your friends and fellow artists. 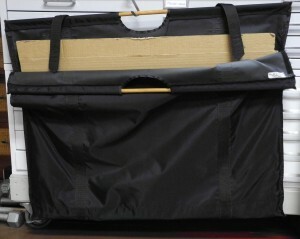 Sew Your Own Painting Carrier & Make Life Easier! We artists fully understand the word “schlepping” as we carry our paintings from one venue to another. Most painting carriers are too stiff or just don’t work for us for a number of different reasons. Carrying our paintings is often a challenge because it is not easy to transport our treasures and to do so carefully. Our paintings are fragile and easily damaged. Where did I get the idea for these bags? Curiosity it one of my life’s values. Throughout my life I have always scanned my world. Often I come upon images, objects, books, articles, etc., that catch my eye and I integrate them into my life or I share them with others. In this case, my beloved, late mother-in-law found something for me. She showed me a painting carrier that a small country library – Rolling Prairie Libraries – in central Illinois used. Back in the 1980’s this library loaned out framed prints to their patrons. She wondered if I would like to have some of their painting carriers as they were no longer offering this service. I grabbed them happily. They are made out of a light canvas and were getting dirty the more I used them. I also wanted different sizes. Below you can see several in my storage bin. These are of various lengths and depths though this is not obvious in the photo. Never deterred and having sewed since I was 5 years old, I developed a pattern to sew several for schlepping my paintings. I chose different sizes that met my needs. 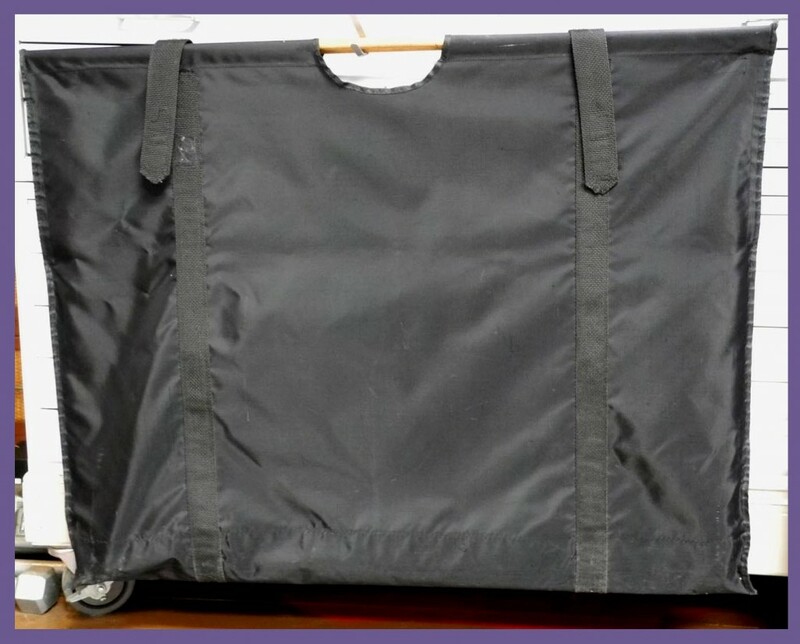 My favorite and most frequently used carrying case is 28″deep x 36″ wide. I use a sturdy rain repellent fabric. 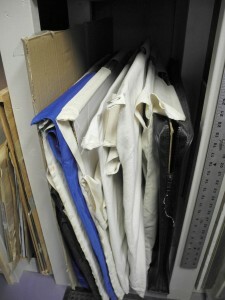 Black and blue nylon fabric are my most commonly used fabrics. 1. 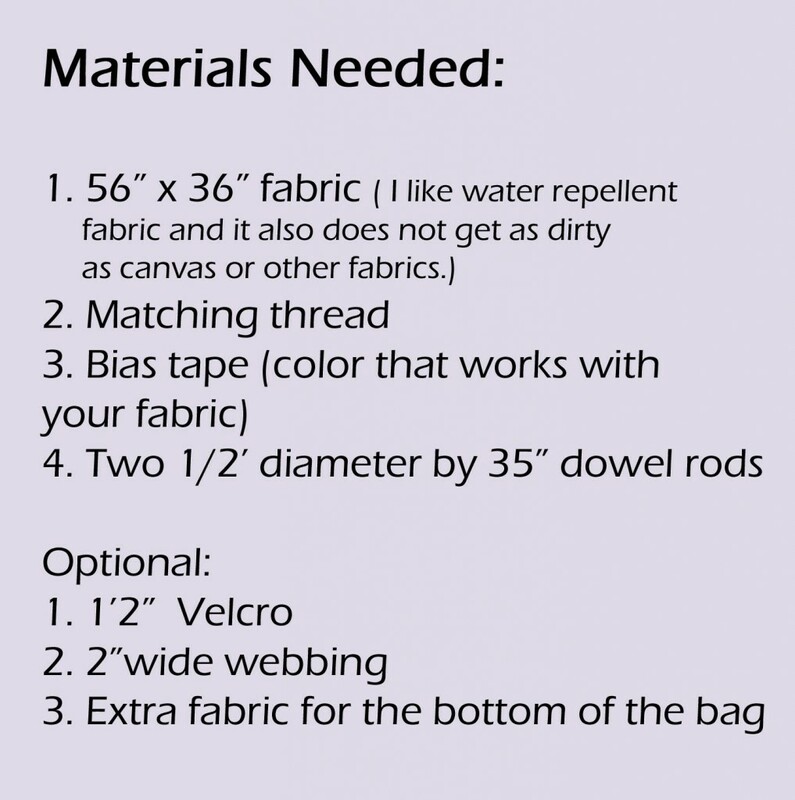 Cut out a piece of medium weight sturdy fabric approximately 56″ long by 36″. 2. With a contrasting marker, indicate the center of the fabric on the shorter ends.